A major goal of neuroscience is to unravel how nerve cells in the brain communicate with each other to generate behaviour. As the brains of humans and other mammals are hugely complex and consist of billions of neurons, scientists use less complex animals as model species to untangle the basic principles. The small worm C. elegans is a particularly good model for this type of research. It only has 302 nerve cells and their network of connections has been precisely mapped, allowing scientists to investigate in detail how its nerve cells communicate with each other to achieve certain types of behaviour. Nerve cells “talk” to each other by exchanging chemical messages. Changes in behaviour, long-term behavioural states and strategies for long-range locomotion, such as finding food and staying at a food source, involve modulation of neuronal circuits by various chemical messengers, including dopamine, serotonin and several neuropeptides. In simple animals like C. elegans, nerve cells multitask as part of sensory, signalling and modulatory systems, to control body posture, coordinate movement and orchestrate more complex behaviours. Alexander Gottschalk and his team focused in this study on a neuronal circuit involving a pair of sensory nerve cells that detect the presence of food, and release the neuromodulator dopamine. This dopamine signal affects two types of downstream neurons, termed DVA and AVK. The team discovered that these two intermediate neurons are affected by dopamine in opposing ways and thus mediate responses to the presence or absence of food by antagonistic neuropeptide signaling to further downstream motor neurons. These two cells thus either promote dwelling and local search behaviour (DVA), or dispersal and long-range search behavior (AVK). 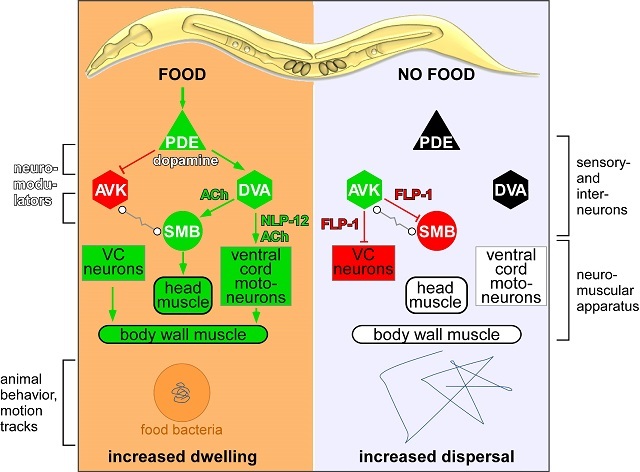 This shows that food signals are relayed via dopamine to peptidergic neurons that switch the motor system to adopt different locomotion strategies. The DVA neuron modulates locomotion by signalling to motoneurons via the neuropeptide NLP-12. Mammals have an equivalent to NLP-12, the neuropeptide cholecystokinin (CCK), which is also involved in motivated behaviour and locomotion. Its release is also regulated by dopamine signalling, for example in reward-related behaviour like feeding. This shows that during evolution, the importance of dopamine and the neuropeptide cholecystokinin/NLP-12 as neuromodulators has been conserved. They influence motivated behaviour in the search for food intake, but also other actions, if rewarding sensations can be actively gained by certain behaviours. The neuron AVK, which acts as an antagonist to the DVA neuron, releases a neuropeptide called FLP-1 in the absence of food. This neuropeptide inhibits motoneurons to regulate body posture and velocity. FLP-1 acts as a counterpart to NLP-12/cholecystokinin in the worm. Although FLP-1 this is more likely to be invertebrate-specific, similar 'RF-amide' neuropeptides are found in mammals, where they also control food intake. Thus, similar inhibitory balancing of cholecystokinin signaling may also be found in mammals. The C. elegans neuron types identified in this study may thus provide important guidance in the search for similar cell types in mammals where myriads of cells mediate similar mechanisms of motor control. Figure legend: Simplified neuronal network mediating food responses and regulating locomotion in C. elegans. Sensory neurons for mechanical cues of the presence of food relay information via dopamine (DA) through interneurons and neuropeptides (FLP-1, NLP-12) to the motor system. Nerve cells are drawn as triangles, hexagons or circles (depending on the type of neuron, triangle: sensory; hexagon: intermediate neuron; circle: motor neuron). Neuromodulators include dopamine, neuropeptides NLP-12 (similar to the cholecystokinin of vertebrates) and FLP-1 (an RF-amide neuropeptide; these are found in mammals only in a distantly relatedform). Dopamine, released by the PDE neuron, inhibits the AVK neuron and activates the DVA neuron. AVK releases FLP-1 (as an inhibitory neuropeptide), DVA releases NLP-12 (as an activating neuropeptide). Certain nerve cells in the neuromuscular apparatus have receptors for one or the other neuropeptide and are thus activated (always marked green) or inhibited (marked red). If the corresponding neuron or muscle group is not modulated (e.g. because a neuromodulator is not actively released, or because food is not available), it is marked in black or white. The traces left by a single animal on a plate with or without food (bacteria) within a certain period of time are indicated below. Credit: Amelie Bergs.